The stock market bounced back strongly during January of 2019. Even I was surprised by the wild swing in stock market valuation in just 1 month. 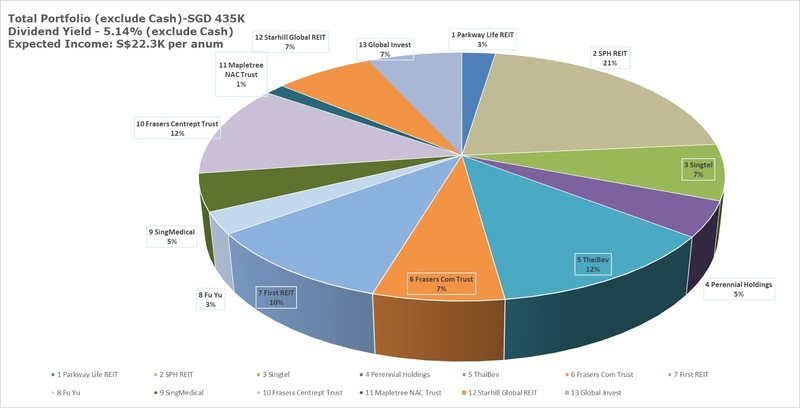 My portfolio including cash rallied from S$405K (based on what I documented for 31 Dec 2018) to S$445K- an increase of almost S$40K (S$32K capital gain from favorable stock market volatility and S$8K capital injection in Jan'19) which brings the overall investment back to profitability. I am a pessimist on this. Within a short span of just 1 month, there is not much improvement in overall macroeconomic conditions. However, share prices have rallied strongly. The risk of Donald Trump slapping an additional tariff on 1st March 2019 on US$200 billion of China goods is still there. China's growth has, in fact, started slowing down based on recent announcement. Wow you had such a fruitful 2019 so far, that is almost up by 10% in a single month this year. You managed to pick the right winners which had massive positions in your portfolio! Lucky I guess. Too much volatility these days. May i know what is your total invested capital out of your portfolio value now? Hi "Anonymous", depends on your definition of "ïnvested capital". Pure external capital injection or inclusive of dividend income re-invested? You can roughly made a guess by going back to my last detailed records in Oct 2012. 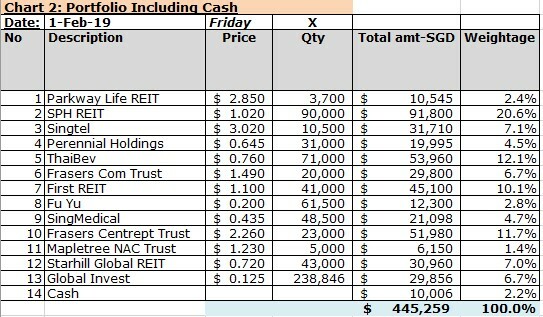 I reinvested all my dividends yearly and invested additional S$15K to S$20K from savings. Also, took out S$30K for renovation a few years back. Hence a moderate growth for my stocks portfolio. Basically I got kind of lucky many years back with Macquire Infrastructure Fund, Sabana and Starhub.